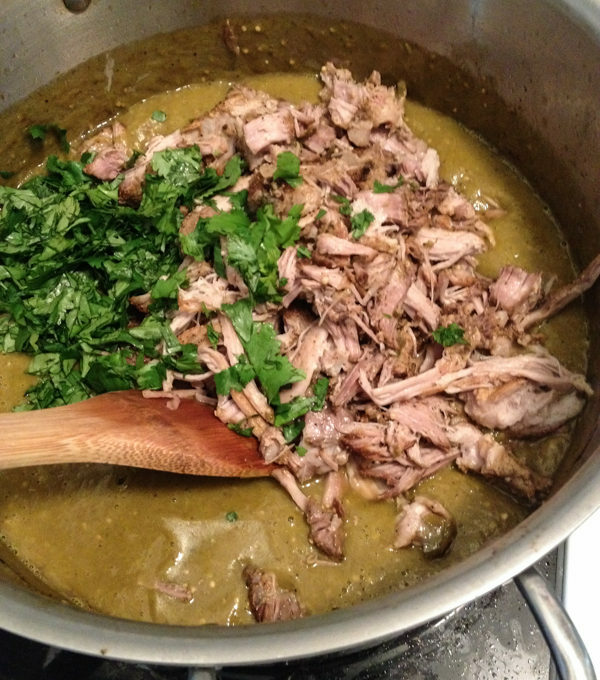 Is it green chili or green chile? The name comes from New Mexican chile peppers, but it seems those peppers are actually Hatch chiles, which aren’t in this stew, though the poblano green chile is in this recipe. I named this dish Southwestern Chicken Green Chili because it’s a soupy-stewy pot of awesomeness, similar to a beef-and-bean chili. The original recipe from a New Mexican friend calls for a 3-pound cut of boneless pork shoulder, which can be a bit challenging to obtain at a decent price. But since bone-in chicken is ubiquitous and affordable (79 cents per pound for chicken leg quarters locally at Wegmans in Fairfax, Virginia, and Fresh World in Springfield, Virginia), I decided to give it a go. The original recipe also calls for fresh tomatillos. But then I saw a can of tomatillos and thought, “Well, they just get tossed in the pot to get soft and full of flavor anyway, so…?” Tomatillos are in season now, however, so you might be able to find them more easily and affordably than at other times during the year. Preheat oven to 350 degrees. In a large (about 8 quart) oven-safe pot, warm oil on stovetop. Season chicken with 1 teaspoon pepper, 1.5 tablespoons salt and 3.5 tablespoons ground cumin. Add more seasoning if needed to cover chicken. Brown chicken on medium heat. Add peppers, tomatillos, onions, garlic, and bay leaves. Add juice of ½ a lime and drizzle with a little more oil. Cover pot and cook in oven for 1 hour or until chicken is cooked and vegetables are tender to the point of falling apart. Remove chicken from pot and take meat off bones once cool enough to be handled. Add cilantro to the pot, bit by bit to taste, and blend with immersion blender. (It’s much simpler and safer than putting hot ingredients into a blender or food processor.) Blend to desired consistency, adding flour or corn starch to thicken, if needed. Add chicken to pot and serve in bowls with lime wedges, corn muffins, extra cilantro, cheese. So is it chili or chile? And how do you make it?